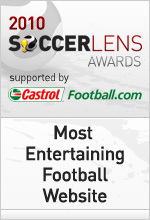 1) You’ve been nominated for Best Football Gear Site, chosen by both fans and industry experts, how does it feel? It’s a real honour! Here at Footy-Boots.com we strive to get the latest news, reviews and opinions on football boots up every single day – and it’s a real privilege to see that acknowledged by a well-regarded website and your audience and, like you say, fans and industry experts. 2) What kind of year has 2010 been for Footy Boots? Non-stop! We didn’t get our usual Summer quiet period with the World Cup being on, and with talking points like the adidas Jabulani and Nike Elite Series everyone and their brother had an opinion on the latest football gear – so we had to make sure our coverage was extra good! Getting quality new information and articles on Footy-Boots.com every day is something we’re really proud of – and we like to think it’s the reason people keep coming back. If a player is wearing a new boot, or has been spotted in an unreleased black-out model we make sure we let our readers know about it straight away! We’ve also been independently testing and reviewing boots and equipment for nearly 5 years now, so if people want an unbiased opinion on what a new boot is all about, they know where to come! The guys at FootballShirtCulture do a fantastic job (and secretly we’re all big fans of football shirts too!) – as well as news and leaked designs, I think they do a great job in encouraging creativity in their readership by having them design their dream kits; let me tell you, some FSC fans should be offered a job by Nike or adidas ASAP! Other than that, BigSoccer have a phenomenal set of writers and a boots community that’s the best on the web – there’s some guys on there that know almost as much as the Footy-Boots staff. Almost! 5) What’s next for Footy Boots? 2011 will be a really exciting year for football boots fans, and we’ll be covering it every step of the way! We already know there’s going to be a slew of new boot releases that’ll really set tongues wagging, and of course we’ll be revealing, testing and analysing them all before anyone else! We’re big subscribers to the Castrol Rankings, and have done several articles based on their astounding collection of data in the past! It’s unbelievable how much stuff they track from every game in Europe! As for the best player; has anyone answered this question and not said Leo Messi? Every season people wonder if he’s going to go off the boil and have a bad few months; but it just doesn’t happen! And it’s not just showmanship or tricks, he’s neigh-on impossible to take the ball off of and his work off the ball is always making room for the rest of the Barca strike force.